You may recall me mentioning that for health related reasons I was on a liquids-only diet for several months a few years ago, and it left me pretty much never wanting another smoothie in my life. So why am I reviewing smoothies today? Well, sometimes, I get to try products, just because I write this blog. 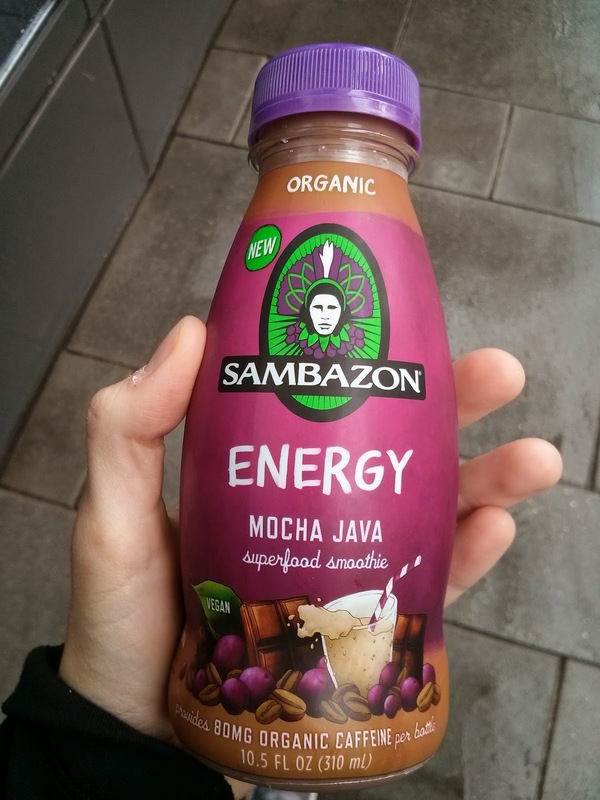 Sambazon sent me coupons to try their smoothies, and I couldn't just let them go to waste, could I? I also decided to share the wealth, and brought a large assortment of flavors to a brunch a friend hosted. It was fun sampling them with all the participants at the brunch, and I gave out coupons for more to anyone who liked them. My mom came to visit when my fridge was filled with these, so I also had a sampling party with her and Ojan, although their reviews were far from stellar. 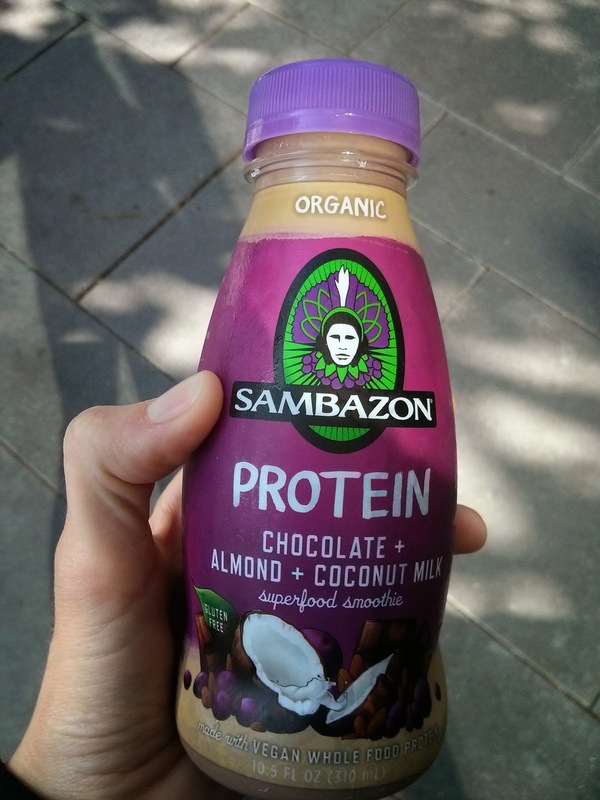 Anyway, I tried products from Sambozon's entire smoothie product line, starting from their basic açaí juice, through their protein and energy enhanced ones. I really did not like most of them, but did find one flavor that I did quite enjoy, and found very, very satisfying after a workout. I probably wouldn't go buy more now that I've run out of coupons, but it was fun to try something new. 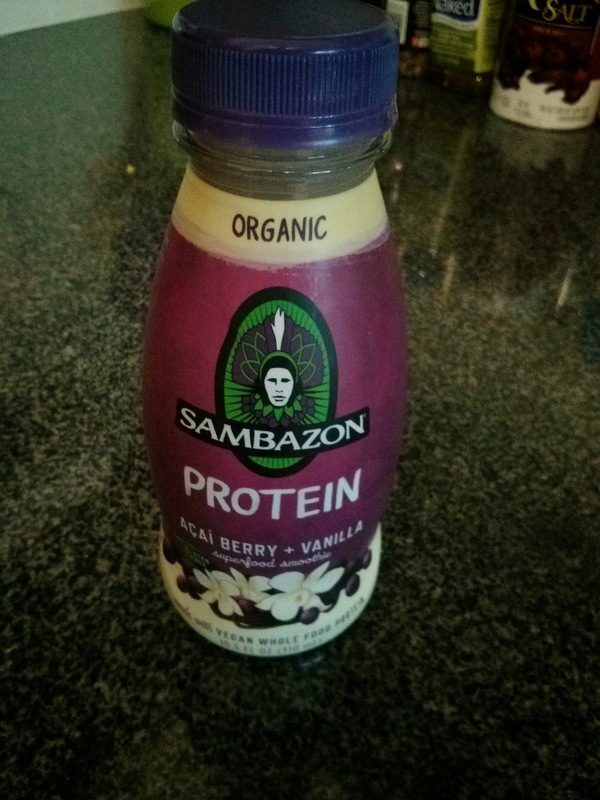 Sambazon also does make açaí powder and sorbet, but I didn't try either of those products. 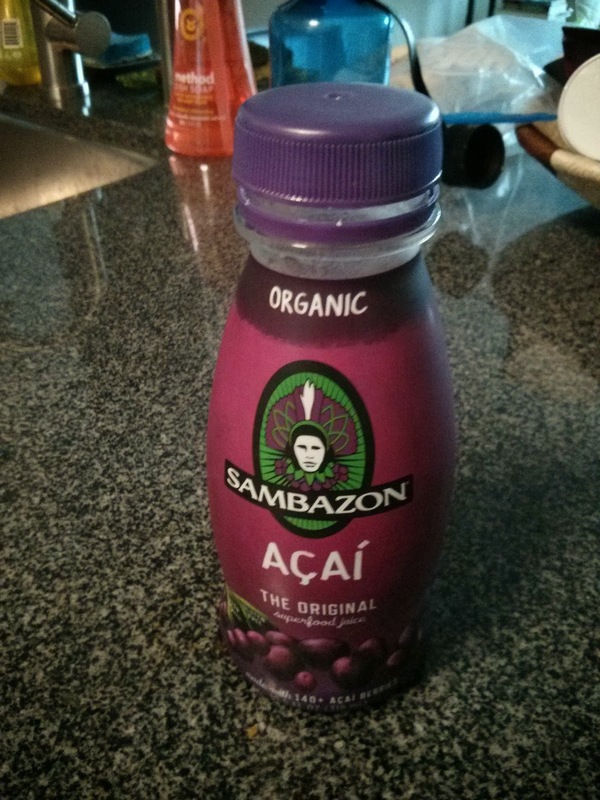 The base of all of Sambazon's products is their açaí, so I started with the basic açaí drinks, available in original, or with Blueberry and Pomegranate added. "Our Original Amazon superfood juice has a delicious cocoa-berry flavor that’s bursting with powerful antioxidants and healthy omegas". 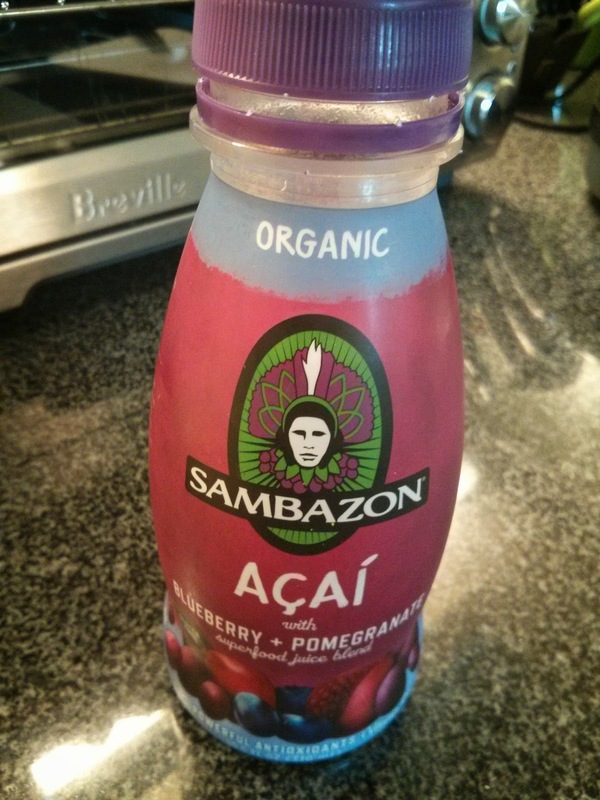 This is basically just sweetened açaí juice, with 1 gram protein, 28 grams sugar. It was sweet. A bit fruity. And just totally not my thing. Perhaps açaí isn't for everyone? My mother and Ojan also did not like this. Açaí with Blueberry + Pomegranate. "Açaí berries, blueberry and pomegranate combine forces to bring you the ultimate antioxidant juice experience." Next I moved on to one enhanced with blueberry + pomegranate. It really just tasted like mixed fruit juice. I didn't taste açaí distinctly, just lots of assorted fruit. Apple and grape juice are listed in the ingredients before the promised blueberry or pomegranate, and I they really just made it taste like generic fruit juice. So, not as bad as the original, but, no real reason to drink this. Next I moved on to the protein enhanced drinks, still with an açaí base, but mixed with soy milk for protein, available in chocolate and vanilla. Chocolate + Almond + Coconut Milk. "Delicious blend of açaí berries (over 90 in there!) with chocolate, coconut milk and a hint of almond". I really didn't like this one. It was kinda gritty (from the almonds?) and the coconut flavor was too strong. I like coconut, so it wasn't that, but for some reason the coconut cream was just cloying. It did have 8 grams of protein from the soy milk, but also 22 grams of sugar, so I couldn't really force myself to drink it based on health reasons alone. It was also very thick, which should be good, like a milkshake, but just seemed strange in this form. It also just had a slight funk to it, that I can't really explain. Chocolate, coconuts, and almonds sound like they should combine together well (Hello, Mounds Bar! ), but here it just didn't work. My least favorite of anything I tried. "Delicious blend of açaí berries (over 100 in there!) with vanilla soymilk and hemp protein". I'm starting to disagree with their whole "delicious blend" marketing. I did not like this. It was crazy sweet, 22 grams sugar to the 8 grams protein provided by the soymilk. Maybe I don't like açaí? I dunno. It was thick and a strange texture, too sweet, and I didn't taste any vanilla. I was hoping for something resembling a vanilla milkshake and this was sadly not it. Ojan and my mother thought this was the best flavor they tried. Ojan still didn't want more than two sips, but my mother took at least three (sips that is). Next up, enhancing things further, is the energy line, with yerba mate added, along with the classic açaí base and soy milk. Available in the mocha flavor I tried, but also in one with guarana, that I was never able to find, no matter how many different stores I checked. Mocha Java: Açaí + Chocolate + Fair Trade Coffee. "A powerful blend of chocolate soy milk, yerba mate, and fair trade coffee". This was one of my favorites, and everyone at the brunch agreed. The thick consistency reminded us of a milk shake, and was best when super cold. The chocolate flavor overpowered the coffee, so I did taste more chocolate than "mocha", but the flavor was good. This product lives up to its "Energy" name, with 80mg caffeine per bottle, as someone who doesn't drink much regular coffee, it provided me quite the jolt. The caffeine comes from both the coffee and added yerba mate. There is also the signature açaí juice in here, but I didn't really taste it as there were enough other ingredients to mask it. Since I liked this so much at the brunch, I picked up this flavor a few more times. I found it to work really well for post-workout recovery, helping me ride out that crash post-workout high, providing me some needed protein, sugar, and energy. Each bottle has 7g protein, which isn't a ton but isn't bad, although it also contains 22g sugar. I'd continue to get this flavor, and it turned out to be the only one I'd regularly purchase. You'd think that they couldn't add many more things to basic açaí juice, but, they can. The final line is "blended breakfast", which mixes in grains and seeds, along with the açaí and soy milk. Blended Breakfast: Strawberry + banana + chia + ancient grains. "A delicious blend made from whole fruit, ancient grains, chia and non-gmo verified soy milk"
This was a strange one. It reminded me of a liquid peanut butter and jelly, even though there is no peanut butter. And, it turns out, liquid pb&j isn't actually a good thing. Thick and gritty from the grains (quinoa and amaranth), and little bits of strawberry and banana, it was one of my least favorites, but the flavor was intriguing, so I did keep going back for more. But I certainly wouldn't get another. And finally, supergreens. Only available in a single flavor. Mostly a mix of juices, with apple, grape, ginger, and acerola juice, plus banana and mango purees, and of course, the supergreens: wheat grass, barley grass, alfalfa, spirulina, chlorella, and kale. I didn't like this at all. But then again, I'm just not in to juicing. 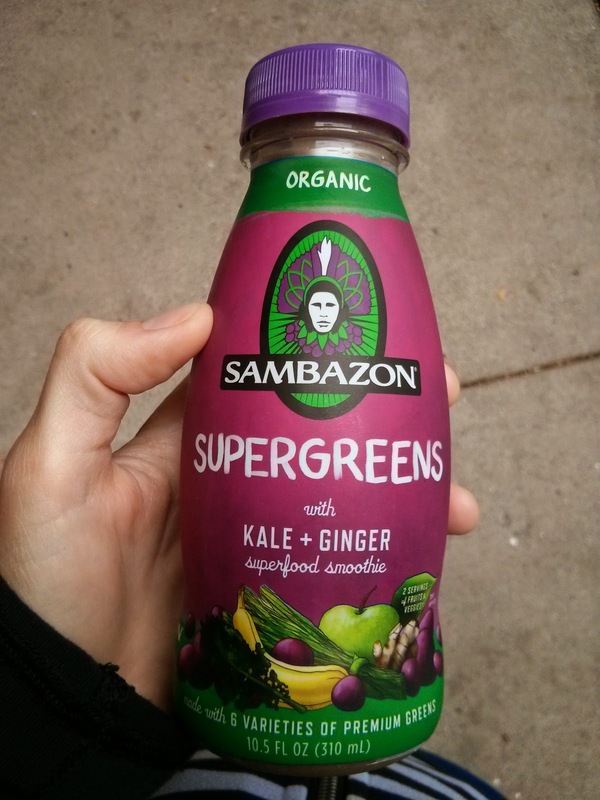 I tried it just to fully experience the entire product line Sambazon has to offer. The consistency was strange. The purees made it thick. It was sweet and bitter at the same time. The ginger was way too strong. I absolutely did not like this. I don't care how good for me it was! Ojan and my mother both tried this, took a single sip, and got some priceless expressions on their faces. My mother pondered if it was the last thing left on the planet to drink, if she'd really bring herself drink it. Do you wonder where I get my dramatic side from? Last week, I reviewed Epicenter Cafe, specifically to discuss the tasty scones from Sandbox Bakery. 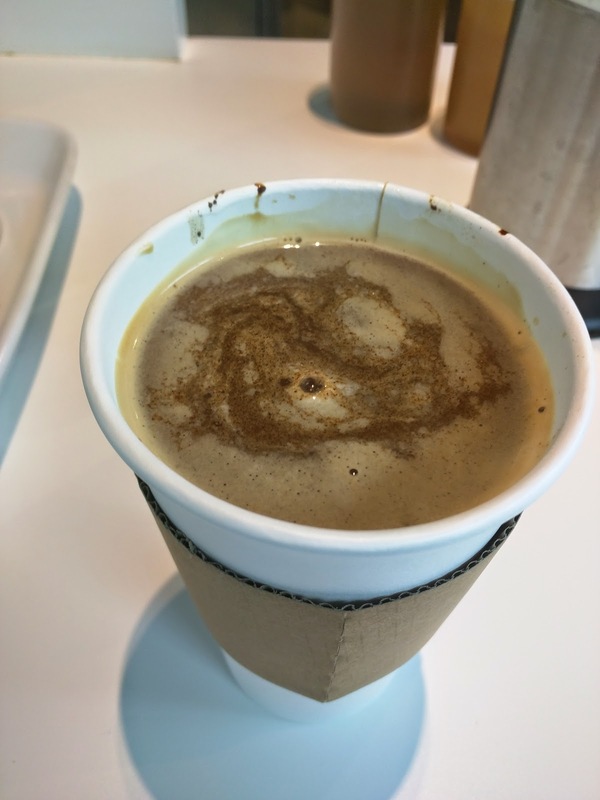 This week, it is time to visit another cafe, Coffee Cultures, again to focus on the baked goods. They are open only M-F, so I haven't had many opportunities to visit. I did actually try the coffee (Counter Culture Coffee), and it was fine, but, you know me, I'm all about baked goods. Coffee Cultures is unique in that they have a very curated set of baked goods from a variety of suppliers, rather than picking just one provider for all their items. And, as you can probably imagine given this fact, they don't use City Baking, like seemingly everywhere else (like Prima Cafe, and many others). Don't worry, a full review of all of City Baking's products will be coming soon. But back to Coffee Cultures. The baked goods all look amazing. The croissants (plain, almond, chocolate, or ham and cheese) come from the famous Patisserie Philippe. The cookies, from my favorite cookie place in the city: Anthony's Cookies. And the muffins, which I was there to try, from Mr. Holmes Bakehouse. This was my first time tasting goods from Mr. Holmes, and I assure you, it won't be my last! I didn't try it, but they also serve Straus froyo. Mr. Holmes Bakehouse Blueberry White Chocolate Muffin. $3.50. The first item I tried was a blueberry white chocolate muffin. It sounded amazing. Blueberry muffins are always decent, but then add in white chocolate to sweeten it up? And, it looked to have a streusel topping? Yes! My first reaction upon tasting it was that it was more of a coffee cake than a muffin. The streusel topping really pushed it in that direction. But, it wasn't dry like a coffee cake. It was more like a moist blueberry coffee cake. Loaded up with really plump, juicy, flavorful berries. There were a few white chocolate chips, but they didn't sweeten it up quite as much as I hoped. The whole hybrid coffee cake-muffin style did work for me, but it was a bit burnt on the edges. If it wasn't burnt, I would have been pretty happy with it. 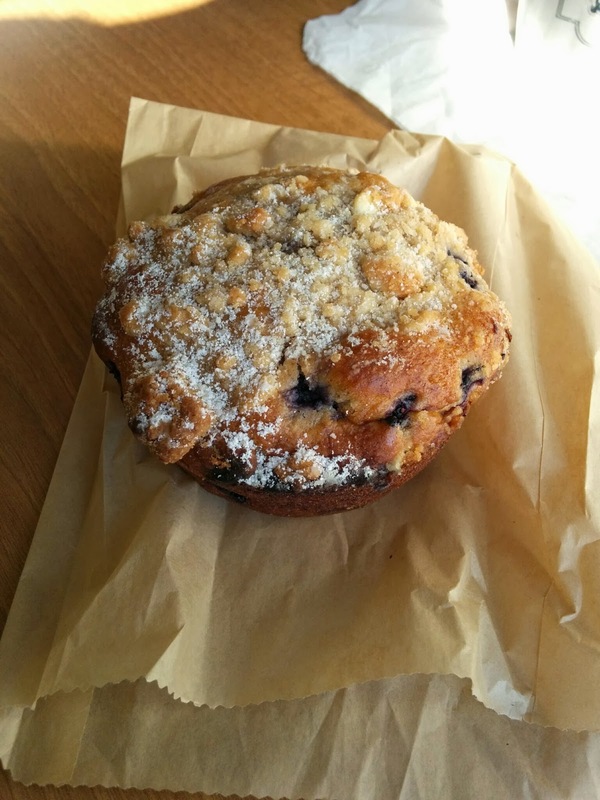 I shared my muffin with Ojan, who loves blueberry muffins, and his first comment was basically identical to mine, "this is half coffee cake, half muffin". We both liked it, but wished it was slightly better than it was. $3.50 was a bit pricey for a muffin, and the baked goods did not have prices listed at the cafe, which is a bit lame. Mr. Holmes Bakehouse Gluten Free Raspberry Muffin. $3.50. On my next visit, I was again drawn to the pastry case. Everything looked phenomenal, and, the selection was largely different from what was there last time. I almost went for the ham and cheese croissant, or the almond croissant, from Patisserie Philippe. They looked marvelous. It was a good muffin. Dense, but not in a bad way. Incredibly moist. Unlike my previous muffin, it was perfectly cooked, no burnt edges. It was loaded with raspberries, which added pops of even more moisture to the inside. And to cap it all off, it was sprinkled with large chunks of sugar for a bit of extra crunch and sweetness. It was very good, and I'd certainly never guess it was gluten free. I also appreciated that although it was sweet, it was clearly a muffin, not a cake. But ... I wouldn't get another. Why? You see, I hate seeds. Remember last week's review of the blackberry scone? I grew up with blackberry bushes in my yard, and my grandmother would make blackberry pies all summer long. I'm sure they were great, except I never wanted anything to do with them, as I just can't stand the seeds. They ruin anything for me. And, although raspberries don't normally have seeds that bother me much, this did have more seeds than I could stand. 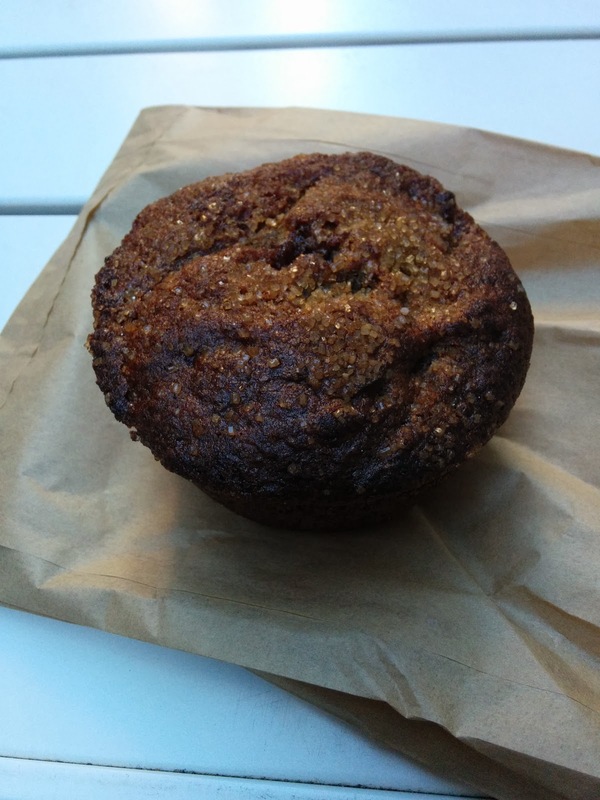 I had such a love-hate relationship with this muffin, as it really was good, but with every bite, I'd have a moment of joy, followed by the realization that there was a seed in between my teeth, which would ruin everything. And then I'd see the sugary top staring back at me, and dig right back in. Rinse and repeat. So much potential, but alas, my own serious hatred of seeds will prevent me from getting another of these. Again, $3.50 felt a bit pricey for a muffin, but Coffee Cultures selects products from fantastic bakers, and you are paying not only for the baked good itself, but also for that curation. In my review of Red Dog Restaurant last week, I mentioned that the coffee I enjoyed came from their neighboring cafe, Fearless Coffee. Fearless is the final installment in Chef Lauren Kiino's trio of establishments in the neighborhood. Il Cane Rosso is the original, a fast-casual restaurant in the Ferry Building serving breakfast, lunch, and dinner daily, which I reviewed a few weeks ago. As I mentioned last week, Red Dog is a full service restaurant, open for lunch and dinner daily, and brunch on weekends. Fearless is the most casual of them all, a coffee shop, open daily for breakfast and lunch. Located next to Red Dog, but in a separate space, and with a totally different decor. The fact that Fearless and Red Dog are actually open on weekends is their first selling point. The neighborhood has seen rapid expansion, of housing particularly, yet the coffee shop and restaurant scene has really lagged behind. As a resident of the neighborhood, I am thrilled to have more options available on a weekend, and casual ones at that. The food philosophy at Fearless is the same as Chef Kiino's other establishments, with a focus on local, organic, fresh, seasonal cuisine. At Fearless, there is an emphasis on grab-n-go items, as it is designed to be a quick option for office workers nearby, which makes sense, given the location inside an office park. These items are available in coolers for self-service, and a few other things can be ordered at the registers. They also have a small marketplace of assorted packaged goods from local vendors, including my favorite coconut chips (Dang!, which I just realized I have never reviewed. I'll have to fix that soon!). The breakfast menu includes a few breakfast sandwiches, a healthy quinoa bowl, and a couple items also featured at Il Cane Rosso or Red Dog, like their cinnamon toast or a yogurt parfait with housemade granola and fruit. A few pastries round out the offerings, including a savory sausage roll, several types of muffins (strawberry-streusel, bluebery-meyer lemon, and banana pecan), and coffee cake (the muffins and coffee cake are available for brunch at Red Dog too). For lunch, the menu is soups, salads, and sandwiches (hot or cold), which sounds similar to Il Cane Rosso, but the selection is much, much larger, but (gasp! ), Fearless does not have the signature warm egg salad. The most exciting part of the menu, for me at least, is the dessert selection, since, as you may recall, I was saddened by the fact that Il Cane Rosso has only a single cookie available. On all my visits, service was friendly. And they had samples of baked goods at the register, which is always a bonus for me, as I love trying everything. I took my items to go, but they did have a few tables inside and out, along with plenty of seats around the fountains in the office park. 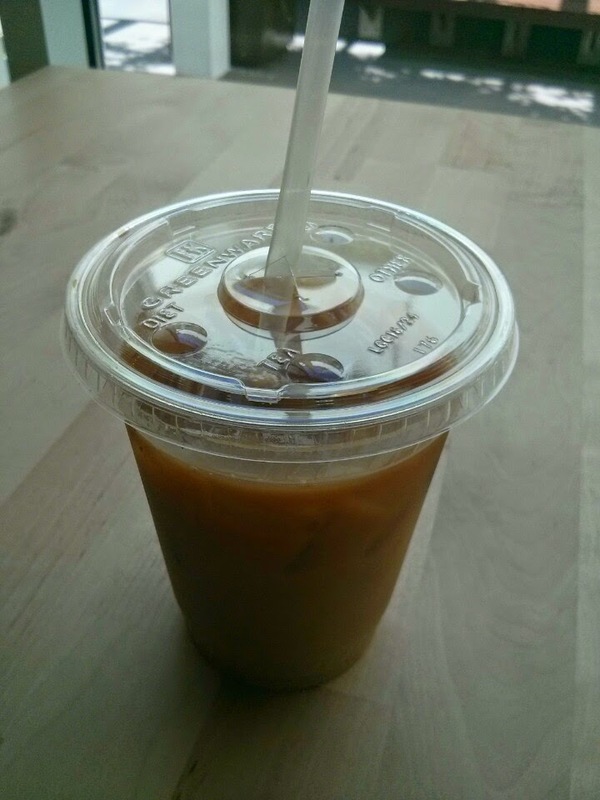 Decaf Iced Americano, Small. $2.25. Since I was at a coffee shop, I had try the coffee, even if I was mostly eying the dessert. It was a hot day, so I went for iced. If I were a regular coffee drinker, they have special cold brew, but since I wanted decaf, an iced americano was my only option. It was delicious. I added just a hint of milk and sugar since I tend to like my iced coffee that way, but it didn't need it. No decaf funk to it at all. I can't wait to try the hot coffee next time. $2.25 was a standard price for a quality americano, and I'd gladly get another. On another visit, I finally went for a hot americano. It was really quite good. No decaf funk, not sharp or harsh, very balanced. I didn't even want to add any sweetener or cream to it. But I was there for the sweet treats. You know I love desserts, and in particular, puddings. After all, my blog has a label just for my reviews of puddings. I was delighted to see that Fearless offers several pudding-style desserts, including a very tempting chocolate pudding with espresso whipped cream and a panna cotta, but I went for the banana pudding. Pudding cups are a great idea for Fearless, since they focus on grab-n-go items, and this was easy to take with me. Plus, homemade pudding is so much better than grocery store pudding, and most restaurants do not serve pudding, as it isn't upscale enough. So, it is both convenient and fairly unique. The pudding cup was a layered creation. The bottom layer was banana pudding, next came a few slices of banana, followed by whipped cream, and then, a crumble top. 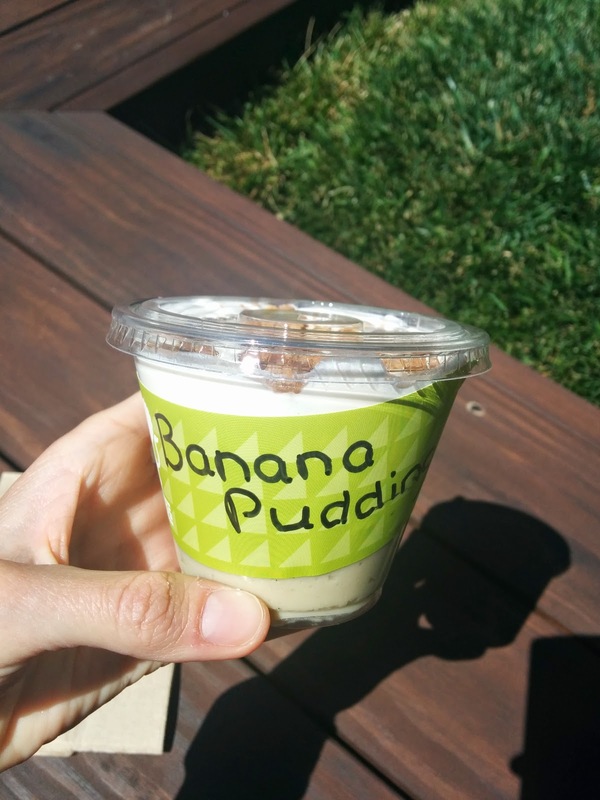 It was like a banana cream pie, turned into a pudding cup. Yes! The pudding itself was thick and fairly creamy, although the consistency was a bit strange, it was almost gritty. It wasn't just plain vanilla pudding though, it did have some banana flavor. The slices of banana were just that, simple banana slices, but fresh, and not turning brown or anything. My cup didn't have many though. Next came the whipped cream, which sorta reminded me of Coolwhip. I think that perhaps because it wasn't freshly applied, it deflated a bit? And finally, the crumble top. I'm not entirely sure what it was, it seemed perhaps like a crumbled oatmeal cookie? 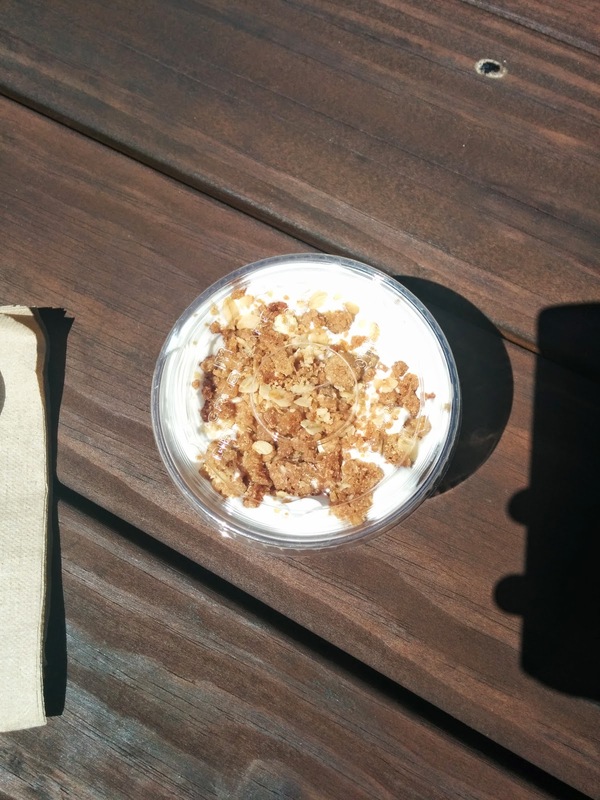 I was going to say it was granola, since it had oats for sure, but, it was more sweet and buttery than granola usually is. The crumble on top was my favorite part, I always enjoy a bit of crunch with my creamy desserts. I loved the idea of this dessert, since I love puddings, and I love banana cream pie. It didn't quite come together for me though. The biggest issue was the ratios: the majority of the cup was the banana pudding, and I really wanted more whipped cream for that amount of pudding. Just adding more whipped cream probably wouldn't work well though, because when eating out of a cup like this, if the whipped cream layer was thicker, then you'd get many spoonfuls of just the whipped cream. So, maybe it would be better with multiple, thinner layers, parfait style? I also would have liked more banana slices. When I got a perfect bite of all the layers, I really quite enjoyed it, but, I was left with lots of extra pudding at the end. Of course I devoured that too, but, I probably wouldn't pick this dessert again. $4 was a fine price for the size of the dessert. I'm very excited to see what else they add to the dessert menu! Caramelized Apple Pecan Tea Cake. $3. My receipt may say "lemon raspberry tea cake", but I believe this was caramelized apple pecan tea cake, with a cinnamon top. 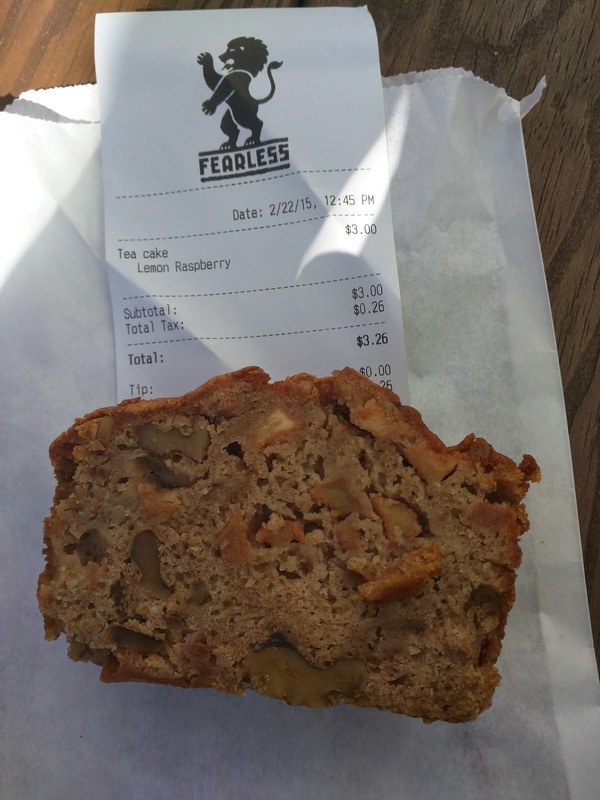 I went to Fearless intending to finally get a muffin, since their streusel topped muffins always look so amazing, but I'm never there at the right time of day for a muffin, so I haven't tired one yet. And then ... I saw the tea cakes. They had several varieties, one was banana nut, the other lemon poppy, and then there was this one. I heard "caramelized apples", I heard "pecans", and I heard "cinnamon on top", and ... it just sounded good to me. I don't know why. I don't really like apples, I don't like quickbreads or cakes ... I blame the word "caramelized". Anyway, this was very moist, dense cake. Not exactly dessert-style cake, not as sweet and obviously sans frosting, but it also clearly wasn't bread. There were generous chunks of well cooked apples. Lots of nuts for crunch. I didn't detect much cinnamon. Nor did I tasted anything "caramelized". Yes, the apples were cooked down but ... I was hoping for something different. So I didn't care for it, and gave it to Ojan, who gobbled it up. I think this was just poor choice on my part, as it was a generous slice, loaded with stuff, and super moist. Just not my thing. Peanut Butter Chocolate Chip Cookie. $2. By now, you probably know I don't really like cookies, but Ojan does, so he picked this up one day. He's been on a peanut butter cookie eating spree these days. So, as I said, cookies aren't my favorite dessert. 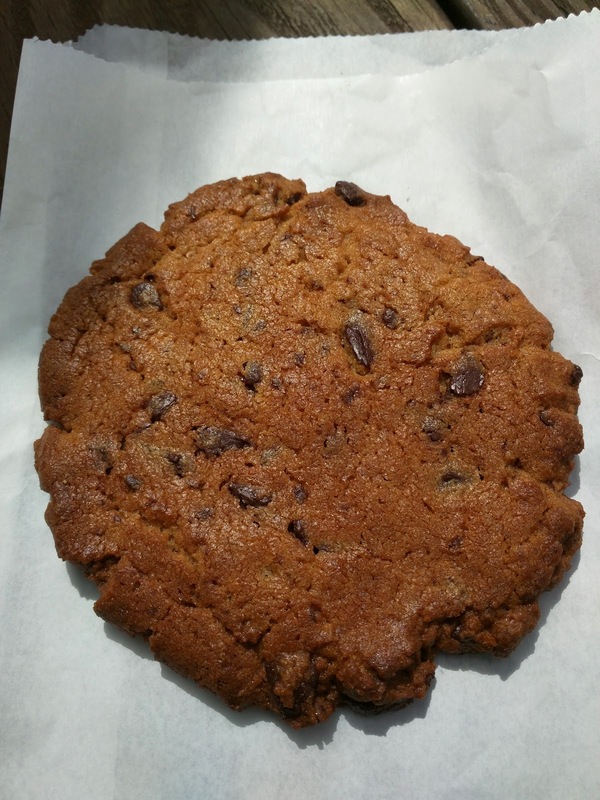 But if I'm going to eat a cookie, I want it to be a thick, soft, slightly underbaked one. This was not that. This was crispy, very crispy. Complete opposite of my style of cookie. But, the peanut flavor was quite good, more flavorful that most peanut butter cookies, and the combination of peanut butter and chocolate is always a winner. If I liked hard style cookies, I'd probably like this, a well made cookie, just not for me. How many times have you walked down Kearny Street near Union Square, right past L & L Hawaiian BBQ, without ever noticing? I can't even count the times I have. Why would I care about a Hawaiian BBQ place? I don't like spam, pork, short ribs, chicken, or really anything on the menu. And, quite honestly, from the outside, the store is not a looker. Dingy, unattractive signage, and, plus, the burgers are $2.49. Mahi mahi sandwiches are $3.49. How is this even possible, given rent in downtown San Francisco alone? Finally one day I noticed the place, and got curious, so I learned more. The history is actually a bit fascinating. They started in Hawaii as a single restaurant, the L&L Drive-Inn, and then franchised in 1988. They became very successful in Hawaii for serving healthy lunches for low prices, apparently voted the #1 BBQ in Hawaii. (Side note. I don't buy the "healthy" claim. For example, their number one seller, the chicken katsu plate is listed on the menu as 1,690 calories! In what world is a 1,690 calorie dish a healthy lunch?) Anyway, they expanded to California in 1999, and renamed themselves L & L Hawaiian Barbecue, to increase the appeal to the mainland market. I guess it must have been successful, because now they exist not only in California, but in several others US states, New Zealand, and even Japan. The menu is designed around a traditional Hawaiian plate of rice, macaroni salad, and a meat entree. I don't like rice, and I am still way too scared of their ridiculously inexpensive meat, but I do love macaroni salad, and I was fascinated by the place. So, I finally ventured in. Service was fine, you order at a register, and my side dish was ready quickly. There are a few tables and counter seating inside, but I just took it to go, as did many other patrons. Single Scoop Macaroni Salad. $1.10. Now, I said I like macaroni salad, but, I honestly had no idea that macaroni salad is a Hawaiian thing. In my head, I think I expected bits of pineapple in it or something to make it "Hawaiian". 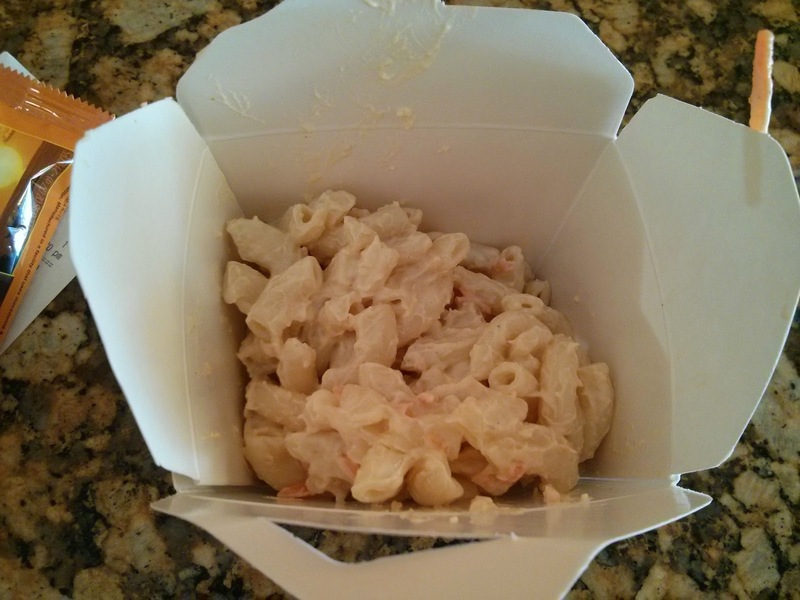 Instead, it looked just like regular macaroni salad. But, it was a bit different, once I tasted it. The macaroni was decently cooked, although softer that I prefer. I later learned that this is the Hawaiian way. The only vegetable was shredded carrot. The sauce was mayonnaise based. And ... there was very little else to it. It was highly unremarkable. It didn't taste fresh. I don't understand why Yelpers give it such positive reviews. Sigh, Yelpers. It made me really wish for the tasty version from Fountain Cafe again, or even the fairly boring version from Deli & ..., as that at least had veggies in and seemed freshly prepared. I even preferred the mediocre version from The Sandwich Spot or the fairly generic one from A.G. Ferrari. But, L & L does win on price. A big container of macaroni salad for $1.10? I still can't get over the price ... not that I'd go back to get it again. Spicely is a local California company, specializing in organic spices. Their products are all USDA certified organic and gluten-free. As a spice company, they are mostly known for spices and seasoning blends, although they also make teas. In fact, when I buy spices at Whole Foods, I usually wind up with Spicely products. But neither of these are things I ever review. They also take their spices and teas, and use them to infuse something I do like: chocolate! I discovered their chocolate recently when I stumbled past their store on Market Street. I also had no idea that they had a storefront. I didn't price check, but I imagine it is cheaper to just get spices directly there rather than through Whole Foods. Anyway, they infuse all types of chocolate, ranging from milk, to dark, to even white "chocolate". Most of the chocolates are infused with their teas, although a few are also made from their spices. 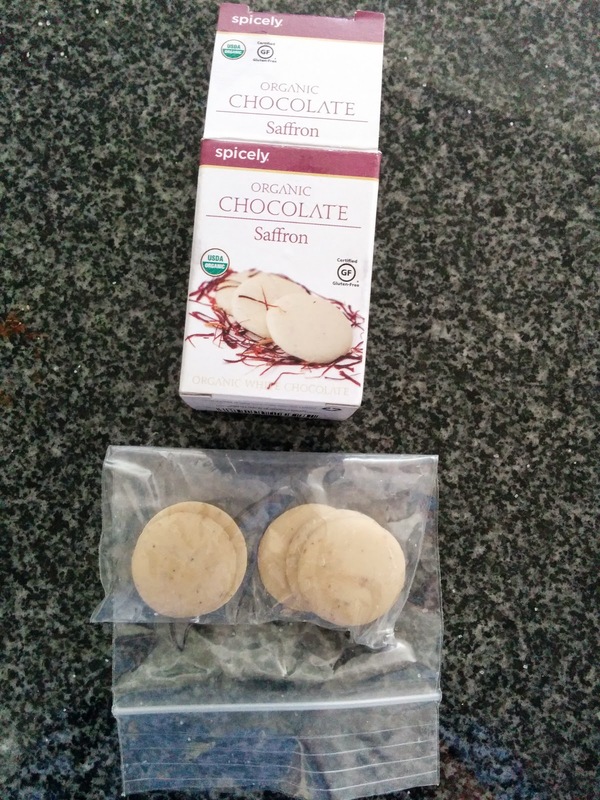 The chocolate comes as little disks, not fully formed bars, just a bite each. I wasn't too impressed with any I tried, as the flavors seemed to just be too subtle. Given the names, and the powerhouse spices and teas infusing them, I wanted more. When I opened the tin, the aroma from the chai spicing was lovely. 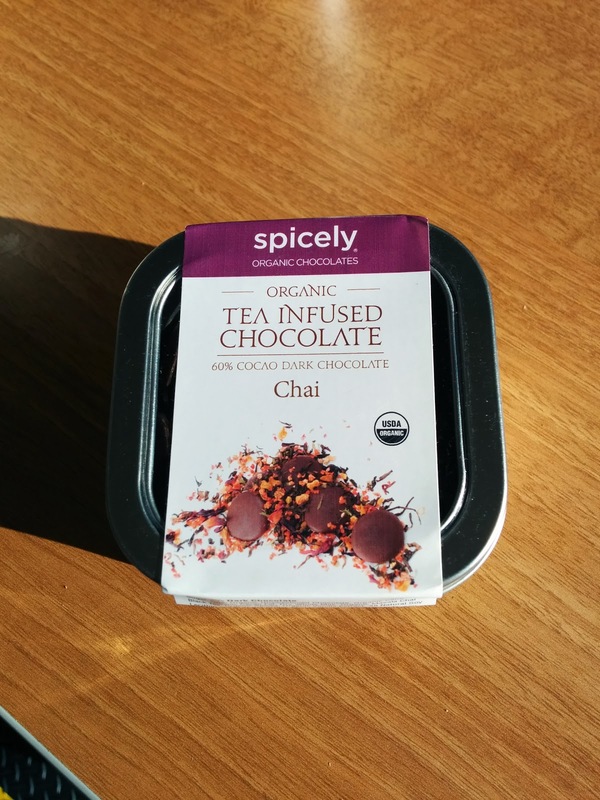 The chai flavors were delicate, a really fun addition to basic chocolate. The chocolate was a mild dark chocolate, only 60% dark, lighter than I prefer, but I think any stronger and it would have masked the chai flavor. Overall this was good, and I enjoyed it, but I wouldn't seek it out. The other dark chocolate I tried is their Raspberry Rooibos. Also a 60% Dark Chocolate. Unfortunately, it didn't have much flavor at all, and I didn't taste any raspberry. I like to pick up little treats for Ojan, and I always think it is fun to bring him things with common persian ingredients. Whenever I spot something with rosewater, pomegranate, pistachios, or saffron, I have to get it! So when I saw a white chocolate infused with saffron, I had no choice. Particularly since he can't eat chocolate, but since white chocolate has no cocoa, this would be fine. I of course took one for myself. I really didn't care for it. I do sometimes like white chocolate, and I do like saffron, but somehow, this just tasted strangely bitter. 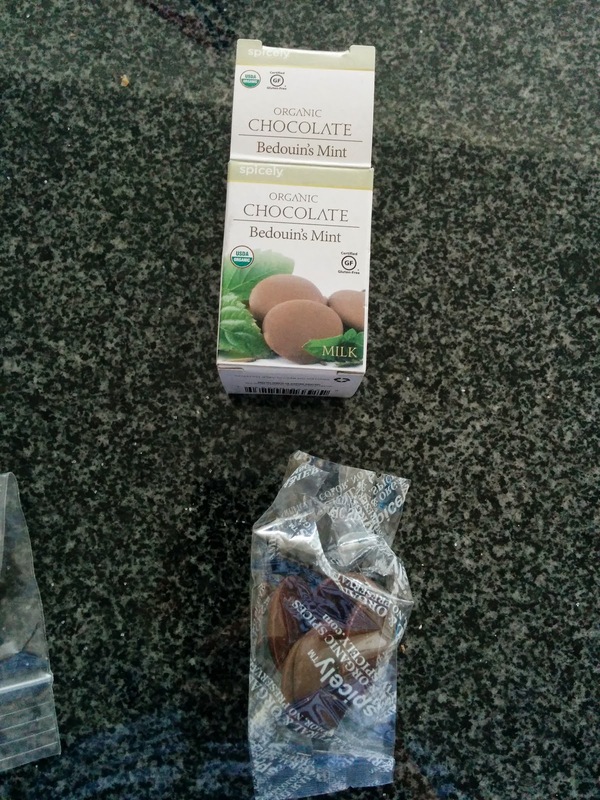 Organic Bedouin's Mint Milk Chocolate. "This milk chocolate is blended with nanamint, peppermint, ginger and orange peel." Finally, I got a milk chocolate. I didn't care for this either. I wanted something minty, and this really didn't have much mint flavor to it at all. How is that possible given all the mints? Orange is the aspect I tasted the most, but even that was very subtle. I wouldn't get this again either.